In the late 1950’s Texan oil tycoon Tom Slick launched an expedition to Nepal. He searched of a rumored hand of yeti hand, now called the Pangbouche Hand, allegedly used as part of a ritual in the Himalayas. That area is home to many legends such as “The Abominable Snowman” with white fur and its redheaded stepchild Almas. He located the hand at a Buddhist monastery in Pangboche. Subsequent treks brought photos of the hand and ultimately the hand itself. The monks declined these fast talking city slickers in coats request to have the hand removed for study. Slick’s associate Peter Byrne cracked a plan: replace the hand with human remains and smuggle it out of Nepal. Then what? 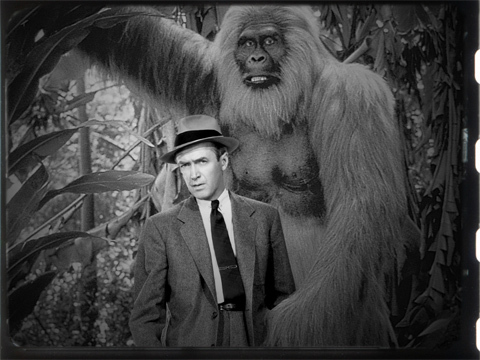 That’s where Byrne and Slick’s hunting buddy/flying pal and all around American good-guy actor Jimmy Stewart comes in. Yes, It’s a Wonderful Life, Harvey and Rear Window Jimmy Stewart. Stewart rushed to India and smuggled the hand to London. To avoid confiscation Stewart hid the hand in his wife’s unspeakables– her underwear. This was confirmed in a letter Stewart wrote to Loren Coleman as Coleman was writing Slick’s biography. Tests so far have been inconclusive if its a genuine article or a hoax. What parts were added by Byrne’s bamboozling or what parts are original also remains unclear. The only clear thing is lets hope Stewart discarded his lady’s underwear after being wrapped in rotten yeti flesh.